I rarely take Randall shopping with me when I shop for myself. He usually dies inside while feigning contentment. It kills me to see him so unhappy. 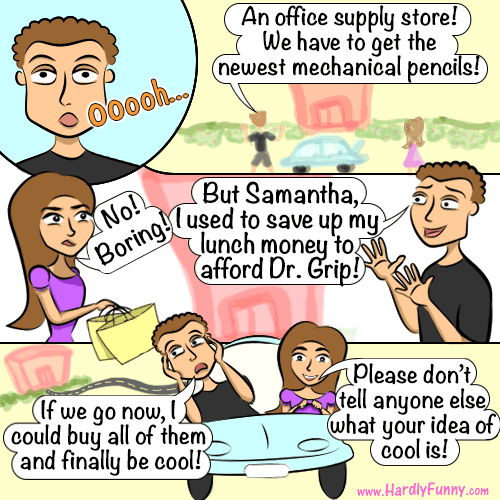 He recalled this pretty nerdy anecdote when we did happen to go shopping together for the holidays and had passed by an office supply store. Yup, he actually said “the cool guys” did this. I just hope they had something to eat for lunch since they weren’t spending their money on a meal. There are more interesting comics to come, of other times that I take Randall into the real world on shopping trips, where he does and says weird things. So this is what my hacker husband, Randall, said to me when I asked him about the conference he was going to (last year). Yup. Pretty rogue-hackerish-sounding to me, and pretty normal – or “badass”- to him. DEFCON is an annual pro-hacking conference in the US that’s pretty well known for its often rebellious attitude. And just so I don’t get shot, I’ll clear the air by saying that “rebellious” can mean something like “rebellion via hacking in a righteous effort to create transparency”. And that’s all I know about DEFCON! I like how Scribbles looks in this comic. She’s just as cute in real life by the way. 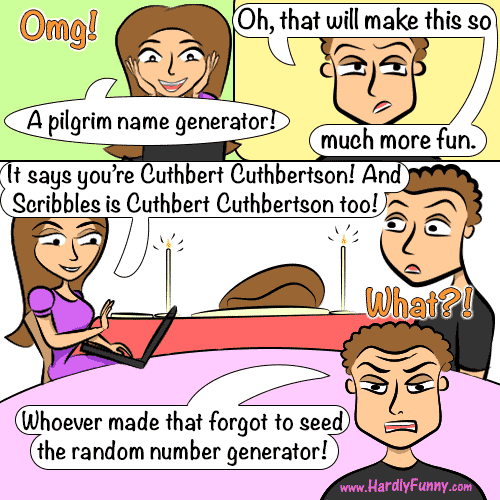 I made placecards for Thanksgiving and found a way to look up pilgrim names. Don’t worry realists, I made Native American ones too. Anyway, Randall was pretty upset that a not-so-passionate programmer forgot to seed his random number generator and therefore, made our names the same. 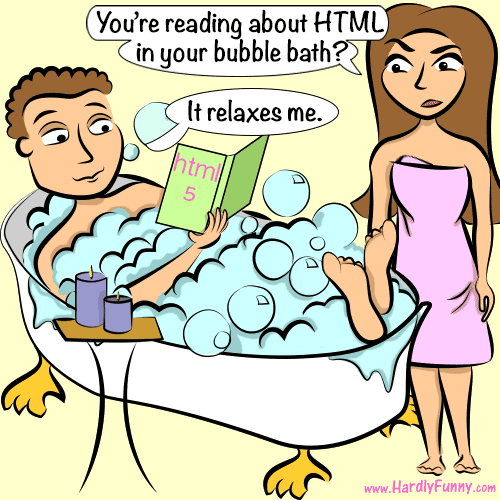 So I couldn’t get into the bath the other day because Randall had cozied up with none other than “HTML 5: an Overview”. Now, whenever I read code books, which is not very often, I do it in front of a keyboard. Maybe this is why Randall takes a bazillion baths and buys a bazillion books. Evil Randall and his telephony (an actual industry) tricks. I always get random phone calls, sometimes with automated voices telling me weird things like this or just a series of beeps. I’m tired of answering my phone and being hung up on and then hearing, “Samantha! My program was able to correctly identify your voice and parse the data!” It’s so annoying when you’re a guinea pig and you don’t know it. Poor lovebug and I went to a concert, where he said this to me. I know what he means though, especially if being offline means talking to strangers, who he calls “not programmers”.